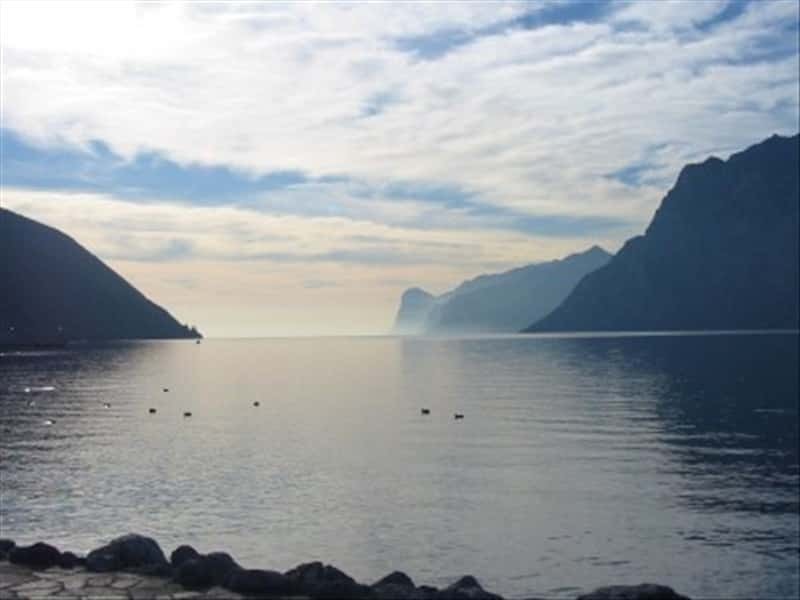 The mild climate, exceptional water temperature (suitable for swimming from May to September), sunny beaches, port facilities, palm trees, oleander, olives and vines make Lake Garda seem a sea set between the Alps and the Po river plain. The lake combines a Mediterranean atmosphere with the charm of the mountains and unblemished natural surroundings. Its waters reflect the rocks and crags of the uplands such as the back of Mount Baldo to the east and the hills of the Trentino - and the Brenta Dolomites in the background - to the north. As well as nature and landscape, Lake Garda also offers a wealth of history: its shores are studded with old towns, castles, monasteries and characteristic villages rich with monuments and interesting museums. From the prehistoric Valtenesi settlements to the Roman ruins at Sermione, Desenzano and Toscolano; from the mediaeval castles that dominate the highlands to the sanctuaries that still attract pilgrims today; from the Scaligere fortresses built to defend the ports to the Romanesque churches; from the Neoclassical parishes to the beautifully gardened private palaces; from the Art-nouveau "waystations" frequented since the beginning of the 1900s by the international jet-set. Fish, oil, citrus fruits and wine form the basis of the cuisine around Lake Garda. The typical, genuine products, served with seasonal vegetables, excellent salamis and delicious cheeses, it cannot fail to bring joy to gourmets. Lake fish, the centrepiece of any menu, includes rare Lake Garda carp, whitefish, lake trout, eel, pike, tench, carp and perch. Garda's extra-virgin olive oil - with its low levels of acidity - is one of the most prized in Italy, as well as the DOC wines Chiaretto and Lugana. This destination web page has been visited 108,731 times.